The winery's history goes back to the 1950s, when Lewis Gibbs Carpenter moved his family from Gilroy, where they had tended cattle and orchards, to Saint Helena. Little did they know then what hallowed ground they had just acquired. It became obvious a few years later that the land was ideal for the purpose, so they decided to plant grapes. That decision turned out to be fortuitous. A short time later, a group of tasters in France picked Napa Valley wines over their own in a blind tasting - and the rest is not only history, but was also a harbinger of the future. And what a future it's become! The grapes for this amazing selection came from Gibbs' Centa Vineyard, which was first planted in 1865. It is located along the Silverado Trail. Today, the winery and vineyards are run by the second and third generation of the family. Carpenter's daughter, Susan Handly, is at the helm, joined by her husband, Craig, and son, Spencer. 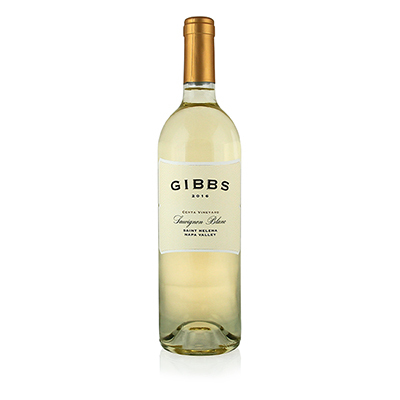 In 2013, when Susan's father passed away, they decided to produce wine under the Gibbs label. Napa is famous for Cabernet Sauvignon. We think the other Sauvignon should get equal billing. Though one is red and the other white, genetically they're part of the same family. Napa Valley Sauvignon Blanc is truly one of the greatest wines made in the state. In the glass, we get powerful flavors of stone fruit, quince and guava surrounded by a robe of lemon zest and spice.